Delete Yelp account and remove your yelp profile from the yelp website. Yelp is a great place to find local businesses in various categories like food, home services local services businesses and more. 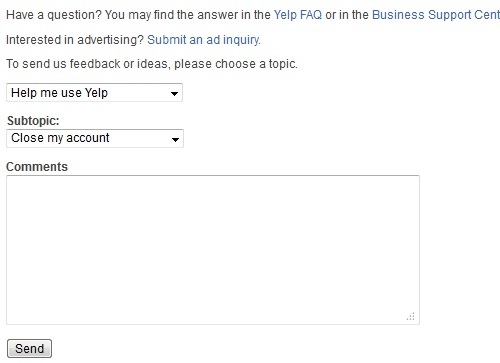 To delete your Yelp account follow the simple steps outlined below and remove yelp profile from the Yelp website. 1. Log into your Yelp account. 2. There isn’t a one-click deletion process that you can use to delete Yelp account. Instead you have to file a request with Yelp to delete Yelp account. 3. Go directly to the Yelp Contact page . Be sure you are logged into your Yelp account. 4. Fill out the form and click Send. Yelp will process your request to delete Yelp account and your Yelp account will be deleted permanently. Yelp is a great social network that any people review local businesses. It provides millions of reviews for users who can select the best local business in numerous categories. Yelp has quickly become the one-stop destination but all information related to local businesses. Like many user generated content website Yelp receives thousands of reviews everyday end-users continue reading businesses on a star rating scale. One of the best use cases for Yelp is if you’re looking to find a restaurant in your city and you want to know what other people think about it then you can use Yelp find out the reading the restaurant in your local city. You can use Yelp’s mobile apps on your smart phone and checking the restaurants that you find interesting and your local city. However if you want to delete your Yelp account, Yelp provides a convenient option to delete Yelp account.